But I digress. Regardless of what happens with Onimusha going forward, Onimusha: Warlords is a truly a great game. If you were to imagine Resident Evil, with its gorgeous pre-rendered backgrounds, labyrinthine maps with plenty of locked doors and backtracking, and horror theme, but were to replace the zombies and science experiments of Resident Evil with oni (demons) and samurai, then you're basically at what Onimusha offers. 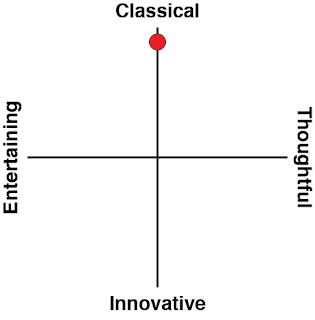 It's got a great plot, however B-grade it comes across. You play as a fellow named Akechi, who is drawn into conflict with Nobunaga Oda and his demon allies after the Battle of Okehazama (a real, historical battle that established Oda as a supreme commander at the time). Shortly after that battle Oda captures a princess under the protection of Akechi (princess Yuki), one presumes for less-than pleasant purposes. Anyone who is familiar with Japanese Sengoku history will get a kick out of the idea of the conflict between a fellow called Akechi (not the same Akechi as the protagonist of the game, though the link there is clear), and Oda. Especially when the historical Akechi is usually portrayed as a villain (for ultimately betraying Oda to his death), even while Oda is regularly referred to as a "demon." Akechi fought the demon in history, and he's doing the same in this game. It's by no means historically accurate or authentic, but the way it plays with history does a good job of grounding it and immediately giving it some sense of lore for fans to follow. 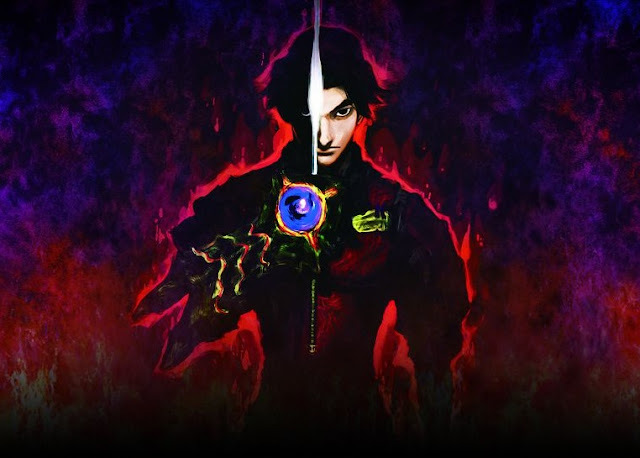 Onimusha: Warlords is a rare game to make a clear conflict between good and evil of the Sengoku period, and, thanks to the rich setting and aesthetics, it does a great job of setting context while getting players into the action right away. 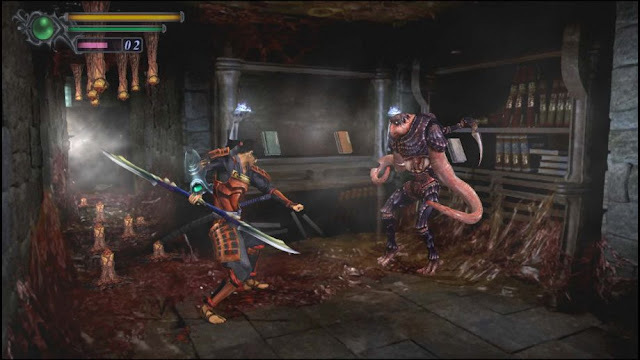 Unlike Resident Evil, with its focus on gunplay, much of the focus in Onimusha is the sword-and-melee skills of Akechi. On a technical level, this isn't executed perfectly. Because the pre-rendered backgrounds are static (i.e. to progress, you need to walk Akechi off an edge of the screen so the game can switch to and load up the next "room"), it's easy for enemies to end up somewhere off-screen. With Resident Evil's guns, as long as you knew they were there you could deal with them. With Onimusha, there's not much you can do than chase after them, moving to another room, were you might end up being hit by an inadvertent attack. On the plus side, limitations on ammunition for weaponry isn't such a concern in Onimusha: Warlords as it was in Resident Evil. There's still some resource management involved - the magic system, for example, is based on a depleting resource that can only be restored by defeating enemies. Resident Evil relied on that lack of ammunition to build tension and horror, however, Onimusha does it in a very different way. 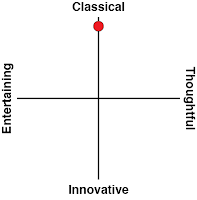 Environments are enclosed, and enemies tend to come in from multiple directions. Flailing around with a sword to try and clear a space safely out of range of their claws can become quite frantic at times. Unfortunately, while the action is clean and enjoyable, there is a lot of backtracking for Akechi to do, and enemies do respawn. It's an archaic throw back to yesteryear, and perhaps the most clear reminder that Onimusha is very much of the "retro" era now. Truth be told, it's also the thing that lets the gameplay down the most. There's nothing enjoyable in knowing that you'll have to backtrack for a couple of minutes, knowing full well that enemies that you've already fought over and over again will swamp you yet one more time. This is particularly true when you're not sure about where you need to go next, so keep stumbling into previous areas looking for the next path forwards. That's not to criticse the design of the enemies, nor the combat in fighting them. 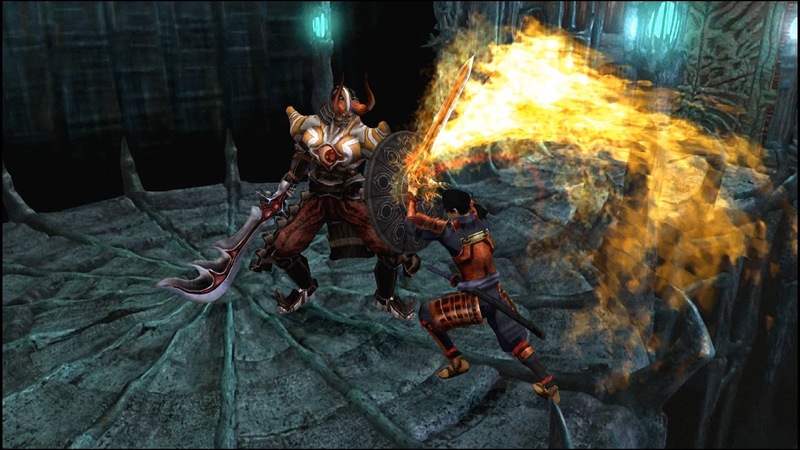 Onimusha has a strategic and enjoyable combat system, and a bunch of enemies with often wildly different abilities and weaknesses, each needing a different approach to defeat. It's a tough game, too. Not as outright difficult as something like Nioh, perhaps, but Onimusha is punishing enough that players will be reminded quickly that old games were usually hard, and that attributing difficulty to "souls-like" games is a bit trivial as a consequence. More than anything, though, I loved exploring the crumbling Japanese castles, fighting over red-fringed bridges, and taking on the wildly imaginative underworld of Japanese folklore. The aesthetics really are spot-on, hearkening back to a time where the biggest Japanese developers and publishers were happy to be Japanese without necessarily caring about how such aesthetics would resonate in the west. Monsters are suitably hideous, and yet at the same time, the game doesn't take itself too seriously. The same terrible B-grade acting that was played for maximum laughs in Resident Evil works remarkably well in Onimusha, and all the characters that you'll come across and/or fight are a likable, personable bunch.